The Bethesda Big Train Summer Baseball Camp returns for its 21st summer of fun and affordable summer baseball camp for girls and boys aged 5 - 12. Camp Director, and Big Train Manager Sal Colangelo, has been named Maryland State Amateur Coach of the Year and most recently the Cal Ripken Collegiate Baseball League Manager of the Year by the Maryland State Association of Baseball Coaches (MSABC), leading Big Train to a CRCBL championship in 2016, 2017, and 2018. Coach Sal along with his star-studded college roster will be in the instructors each week, teaching kids the FUNdamentals of baseball. The best collegiate baseball talent from across the country comes to play for Big Train. Over 100 Big Train alumni have been drafted by Major League teams to play professional ball, including four who currently play in the MLB. All campers will receive excellent instruction in all the fundamentals of the game as well as the opportunity to play in a live game each day. Every camper will receive an official Big Train Summer Camp t-shirt that will get them free admission to all Big Train home games at Shirley Povich Field during the 2019 regular season. Along with our General Camp, we also offer specialized camp sessions including Pitching Camp and Advanced Camp. Both of which are for older and more experienced 9-12 year olds. General Camp: All campers will receive excellent instruction in the fundamentals of the game as well as the opportunity to play in a live game each day. 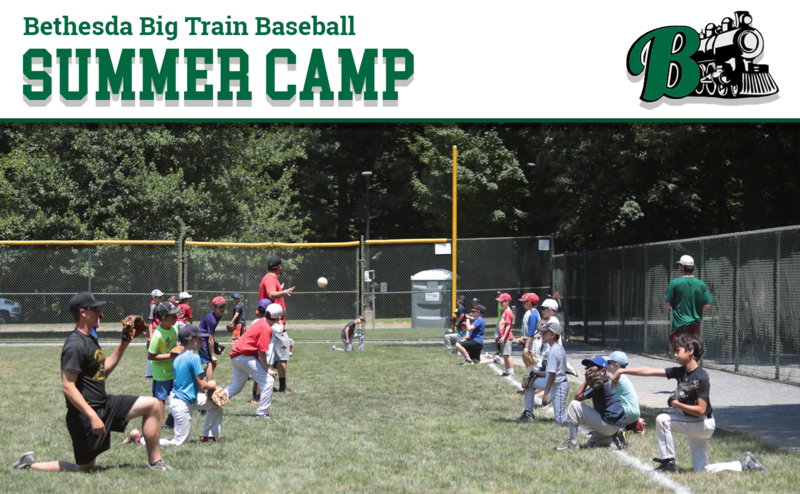 Each camper will receive an official Big Train Summer Camp t-shirt that will entitle the camper to free admission to all Big Train home games at Shirley Povich Field during the 2019 regular season. This session is designed for all skill levels - from beginner level, to the casual baseball player, to the advanced player. Kids with no baseball experience should sign up for this camp. Ages 5-12. Advanced Development Camp: Big Train Manager Sal Colangelo has designed these camps for advanced training for young players with above-average skills. On Monday, Big Train players and coaches will lead the campers through a series of drills designed to improve skills and choose teams for the week's showcase games. Each day from Tuesday through Friday, camp will begin with one hour of skills training followed by a 7-inning showcase game. Each camper will receive an official Big Train Summer Camp t-shirt that entitles the camper free admission to all Big Train home games at Shirley Povich Field during the 2019 regular season. Ages 9-12. Pitching Camp: Affordable pitching camps which provide young players with specialized training can be difficult to find. The Big Train pitching camp provides highly specialized skill development at a very affordable price, just $225 per week. During the camp, 25 players will have the opportunity to receive one-on-one training and participate in pitching drills with Big Train college pitchers, building the pitching skills to get them to that next level. Each camper will receive an official Big Train Summer Camp t-shirt that entitles the camper free admission to all Big Train home games at Shirley Povich Field during the 2019 regular season (Note: Pitching Camp will not meet on Wednesdays to prevent the risk of campers straining their arms.) Ages 9-12. Limited to 25 campers. -Early Bird Special runs until April 15, 2019! -Receive a $10 multi-child family discount when registering multiple campers together. -Sign up online and get 50% off a Big Train Family Pass. Email Davids@bigtrain.org for details. Morning (7:15AM-9AM) + Afternoon (3PM-5PM) = $80 for both or $40 each, per week. Drop off and pick-up location is Shirley Povich Field. Kids will not receive intstruction during Before or After Care but will be supervised by Big Train staff members inside the confinements of Shirley Povich FIeld. Kids have the opporunity to play card games and watch batting practice, among other informal activities. People who cancel their camp registration 30 days or more prior to the start of the camp are entitled to a full refund, minus a $30 administrative free. No refund will be given for cancellations less than 30 days before the start of the camp. People who change their camp session two weeks or less prior to the start of the original or newly signed up week of camp will be charged a $30 administrative fee. 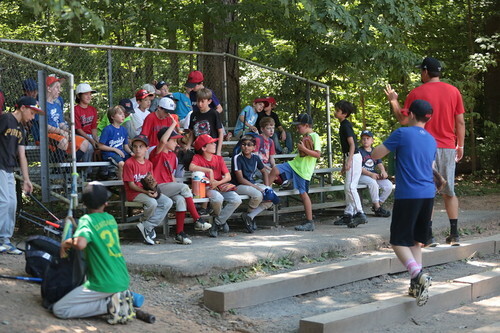 This is an outdoor summer camp, and when it is raining kids will be placed underneath the Pavillion at Shirley Povich Field where coaches will show movies, talk baseball, play trivia and cards. During a rainy day, you are allowed to pick up your kid early. There will be no refunds because of weather. All parents or legal guardians of campers must also submit a signed CAMP WAIVER in order to participate. For carpool pickups and drop offs, please have a note signed by all parents of campers included. If you have any day-to-day quesitons duing your child's camp session, please call Sal Colangelo at 703-967-5855 or Galvin Morris at 703-203-5059. If you have any administrative or sign up questions, please call 301-365-1076 or email davids@bigtrain.org.